Living full time in an RV can certainly have an impact on the relationships of those living in the RV. In our case, it is just Trail and myself along with the two cats, Kia and Kekovar. Every relationship is as unique as the people it is comprised of, so I can only really offer my own experience for your consideration. 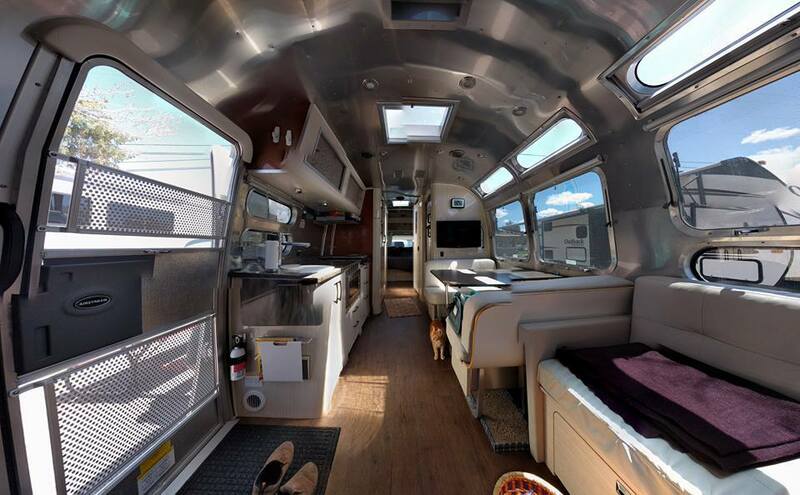 We live in what I would call a medium sized RV, a 30′ airstream. While it is fairly long, it doesn’t have the height of a 5th-wheel or the width of an RV that has slide-out sides. Essentially there are two rooms, a living space with a kitchen, dining table, and couch, and a bedroom that is mostly bed. Between them is a very short hallway with a tiny separate bathroom and shower. In our RV there is essentially no privacy to be had beyond pulling a thin partition between the two rooms, though if you are a cat you can hide under the bed. This is the view from the couch. It’s about 300 square feet and very little of it is unoccupied. Not only is the home front a small intimate space, you may well spend more time there than you otherwise would since most RVers essentially work at home or don’t work at all. If you do go out, you are more likely to go out together since most of the time you will only have one vehicle. You are not trapped, a good notion to hold is that your living room is outside. While I set out with that in mind, the reality is that outside isn’t always all that hospitable due to rain, heat, or insects and if you are a computer creature like me, a good source of power is also important. I would say that Trail and I spend about 95% of our time withing 30′ of one another with the only exceptions being when I use the camp showers or when she is shopping as I tend to like to wait in the car (extended shopping makes me very bored/sleepy and thus a very bad driver). I think for some couples this would be difficult, though for Trail and I it is not that large a departure. When I worked 9 to 5 about the only time we were apart was while I was at work. Even though we had a larger house, nearly all our time would be spent in the same room, even if we were doing different activities. 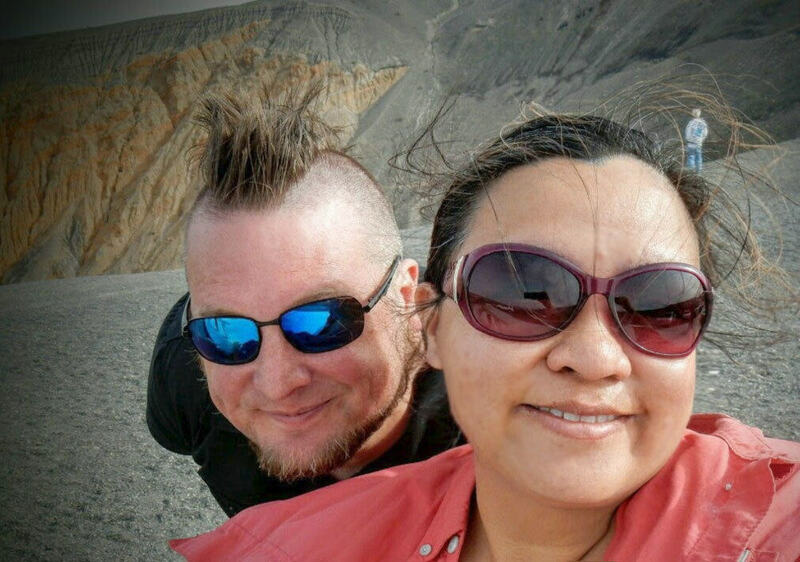 The wild hair selfie at the edge of a large crater we later climbed into and out of. There is nothing about the proximity or lack of privacy that seems to bother either of us very much. There are times when it is somewhat inconvenient. Noise from cooking or the TV is inescapable in such a tiny space so you have to be tolerant of that. One challenge for Trail is that I’m a little grouchy and slow in the morning. When I worked, she was mostly spared that, but now she has to put up with a sluggish sourpuss every morning instead of only on the weekends. Often our biggest challenge is when we are both trying to get things done in the RV which don’t involve sitting down. There is hardly any room to pass by one another so we can easily end up in each other’s way and that can get a bit frustrating for us both. I think the situation could be difficult for other couples. We have always had a fairly harmonious and close relationship. In our more than 15 years of living together (14 years of marriage) we have never had what I would call a big fight. We’ve never yelled at each other, never walked out, never wanted to get away from one another. We sometimes argue, and don’t always see eye to eye, but one of us is almost always willing to compromise or defer to make peace because we both want harmony more than we want to have our own way. Tolerance, acceptance, respect, and compromise are key traits to keeping the peace. Here we are armored up for adventure in the desert sun. Trail is generally happier out on the road than before. Life at home was not especially fulfilling so she got bored easily. 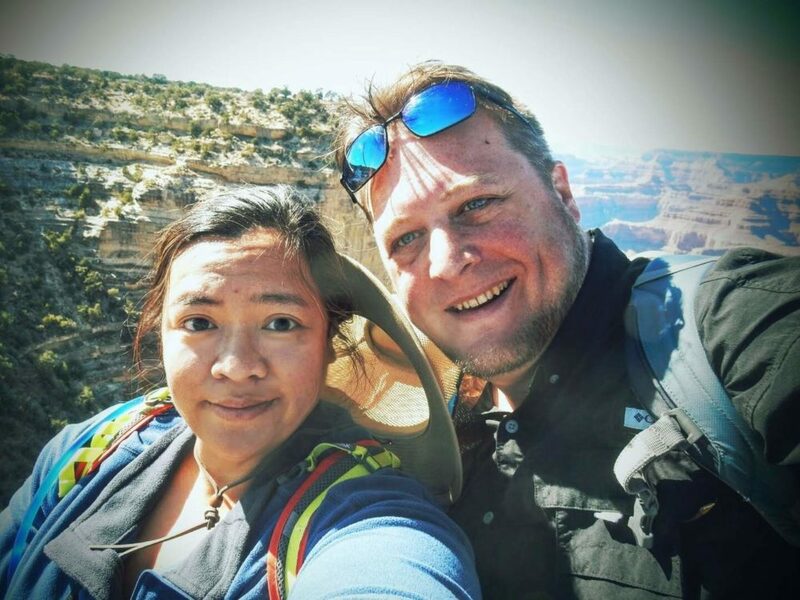 I tended to want to be a homebody while not at the office and both work and the expenses of city living kept us from getting out more than a couple times a year. Now she has new wonders to explore every week if not every day and I can tell she feels satisfied. I really don’t need much more in life than some food, video games, and company so I’m as happy as I ever was. I miss the comradery of the office but love the freedom to work on my own projects and interests. If either of us didn’t like the RV lifestyle, I think the challenges and compromises required would wear on us both. Solitude is another challenge of the RV lifestyle. There are of course plenty of new folks to meet should we choose, but you don’t get regular interaction with close friends and family that you might otherwise have. Trail suffers somewhat from social anxiety so she doesn’t seem to miss it very much. I tend to get a fair bit of pleasure from interacting with people online and from writing, but I do miss seeing people I care about face to trace as often as I used to. Fortunately, Trail and I are as much best friends as lovers so we are both fairly fulfilled in each others company and have enough interests in common we can usually strike up a good conversation. 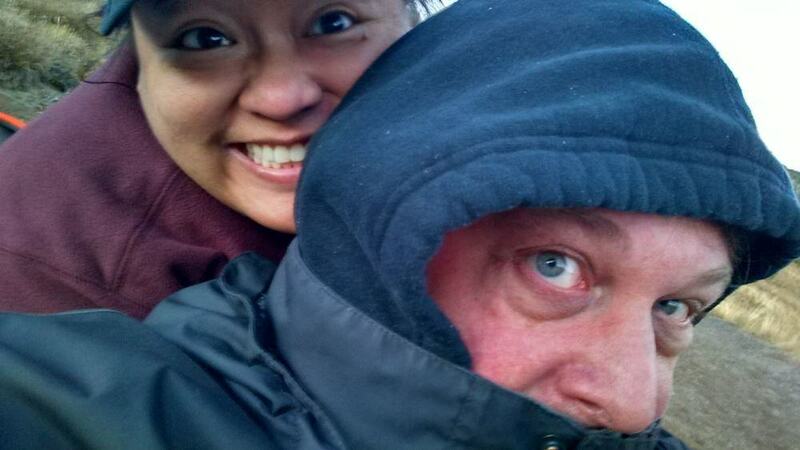 Here we are on Mount Rainier as the sun sets waiting for a lunar eclipse. Of course, we shouldn’t forget our cats. Both of them have adapted to trailer life but it’s clear it puts a little more strain on them and they are more easily bored in the confines of the small trailer. We’ve made sure they have a safe space to hide in when the dreaded vacuum is on the prowl and we try to play with them and pet them a bit more than we did at home. None the less I can tell they were somewhat happier in a big house with room to run around. While we are happy to have two wonderful cats, we’ve both come to feel that they will be the last we keep until we next settle down in one location. So here are my tips for those living full time in an RV or considering it…. Work out a system to avoid getting in each other’s way and making sure everyone’s needs are met. Strive to be equitable in the division of responsibilities with each person contributing what they are best able to provide. Take responsibility for your own happiness and strive to help others be happy as well. Those who know me understand that goofball is one of my foremost traits. Mind you, there isn’t much there that is different than any relationship, but I think it is more important when you live full time in an RV. You have little choice but to cooperate and get along and any rift will be all the more painful. Also, your safety and property are more vulnerable and your options for outside help more limited so you need to be a team to ensure everyone’s welfare and happiness. Taking your family out full time is a risk. The stress and challenge could break a weak relationship. It could also strengthen it so that it can withstand life’s most serious challenges in the future. Wherever there is risk you will likely find a reward for facing it. 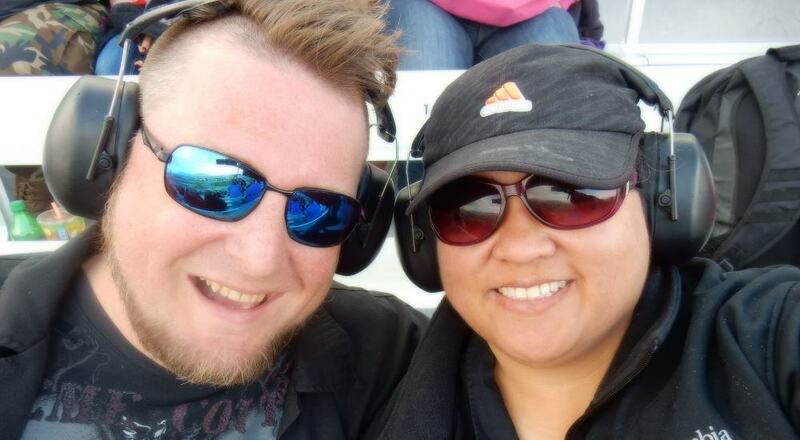 Here we are with matching ear protection at NASCAR in Vegas. So far, our adventure together has only strengthened our relationship and made us both very happy. It’s not without its challenges, but they have been well worth facing, both for our time together, and the experiences we have been able to have. We are each growing as individuals and as partners in life. I can see how Ted and you are friends, and always gotten along well–he too requires little. He is happy with the simple things. Me. Well….we just won’t go there. Haha:). I covet the traits of those who are easily content. I think I am until reality hits! Heck! We are all unique, and that is good! Enjoying reading both your blog entries, though am behind. I DO HOPE you will be making it out our way. It would be really great to hang with you both. Also, I know Sylvia and you two would have fun together. She is a clever and funny kid. She keeps us on our feet, and laughing! Thanks so much Tracy! I always find differences are part of why we have a strong marriage and I imagine it is the same for you and Ted. More strengths to go around and when you don’t share weaknesses you can help each other with them. We will definitely visit when we are in the area though it may be some time yet. 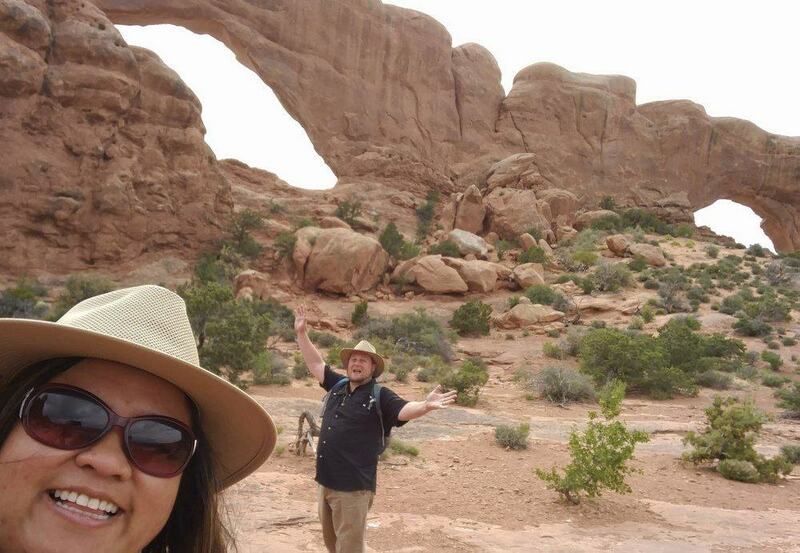 We still have a lot of national parks in the west we want to experience and we have a visit back to Seattle planned. We plan to visit every state sooner or later and the North-East is a lovely part of the country with lots to see. We wish you all the very best till we see you again! You two are must so adorable. Your enthusiasm in contagious!